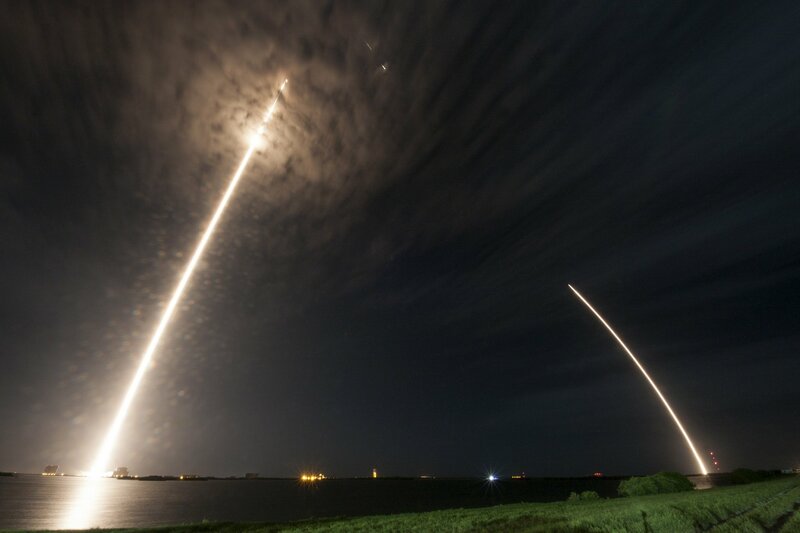 Falcon 9 made an on-time departure at 4:45 UTC on Monday, 12:45 a.m. local time, racing into the dark skies powered by its nine Merlin 1D engines. The first stage fired for less than two and a half minutes, sending the second stage on its way to make a six and a half minute burn to lift Dragon on its way to the International Space Station for an important cargo delivery. 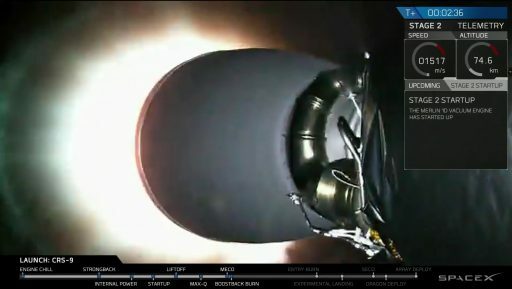 While the second stage was powering Dragon into orbit, the first stage fired its engines to reverse its direction of travel and accelerate toward a descent into Florida. A brief Entry Burn set the stage for a short atmospheric flight with the large booster announcing its return via Sonic Booms heard along the Space Coast. 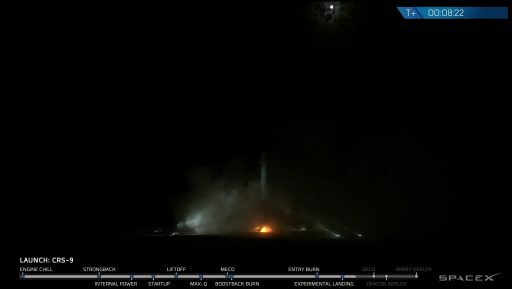 The bright glow of the Center Engine’s exhaust lit up the skies as the stage fell towards Landing Zone 1, slowing down just in time to come to rest on its four landing legs – marking SpaceX’s second land-based landing, a critical part of the company’s future business model of routinely re-using rocket stages. Packed into the Dragon spacecraft are 930 Kilograms of scientific equipment supporting dozens of studies ongoing aboard the orbiting laboratory & covering virtually all fields of science. Notable experiment payloads aboard the Dragon include a DNA sequencer permitting in-space analysis of DNA, no longer requiring samples to be returned to Earth, a new type of heat exchanger to be used on future spacecraft, an experiment involving 12 mice living aboard ISS for a month, and studies looking at the degradation of bone and muscle mass in space to improve health of future astronauts and people on Earth suffering from various conditions. Hitching a ride in Dragon’s Trunk is International Docking Adapter 2, to be attached to the Station’s Pressurized Mating Adapter 2, converting the former Shuttle docking port for automated dockings of future Commercial Crew Vehicles. The first IDA was lost in last year’s Dragon SpX-7 launch failure, placing some pressure on SpX-9 to reach ISS in order to keep up the planned timeline for SpaceX’s Dragon 2 and Boeing’s CST-100 Starliner, set for their first demonstration missions to ISS late next year. Towering 65 meters above its sea-side launch pad, Falcon 9 entered its lengthy countdown in the afternoon on Sunday, when placed into its vertical launch position after late cargo loading was complete. 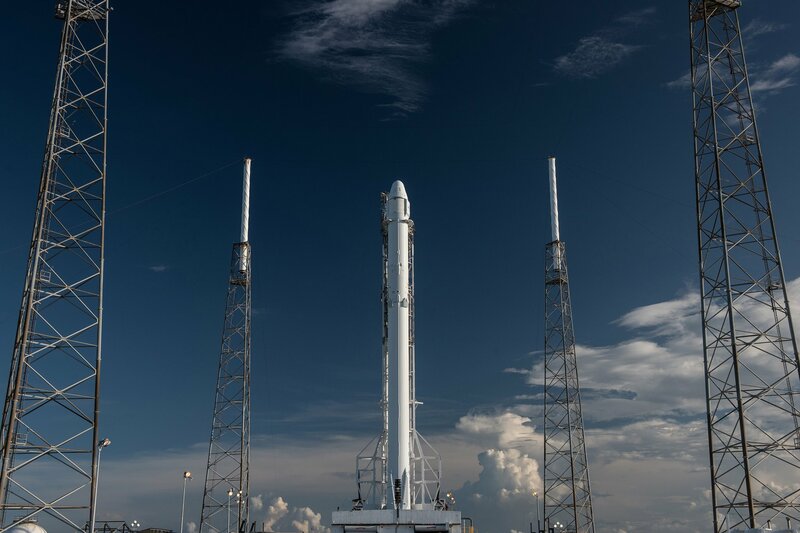 Falcon 9 underwent detailed checkouts before controllers inside the two Launch Control Rooms at the Cape began the setup for the expedited propellant loading operation. 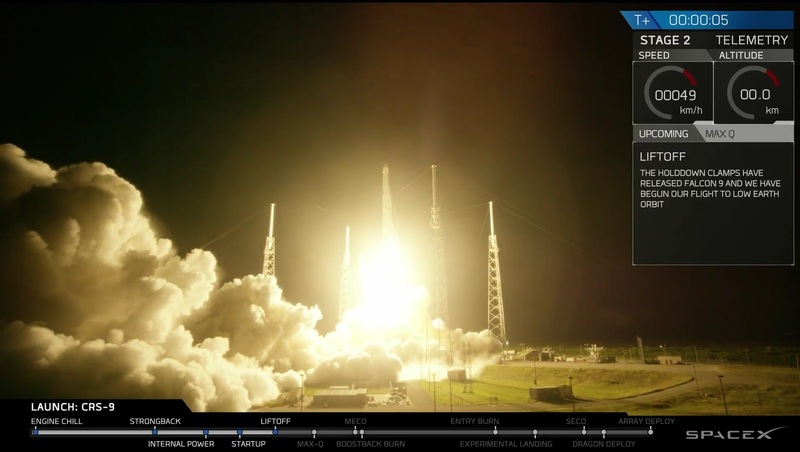 SpaceX has made great improvements since the inauguration of the Falcon 9 FT in managing to consistently launch on the first attempt as the launch vehicle matures over the course of its operational career. After clean checkouts of the launcher, teams buttoned up the base of the launcher and all launch pad systems before clearing the complex for the start of propellant loading setup steps at L-3 hours. By that time, controllers at the Morrell Operations Center had finished the setup of Range Safety Equipment and were watching over the clearance of the launch area. Additional safety measures taken for the SpX-9 launch were the closure of portions of the Kennedy Space Center including the Vehicle Assembly Building and the Press Site. These measures were taken as a precaution for the event of an abort early in flight in which case on-shore winds would carry Dragon toward KSC and, in case of a hard landing, could blow toxic fumes released from the spacecraft over the area. Chilldown operations on ground propellant systems and Falcon’s tanks picked up around one hour prior to the opening of the night’s instantaneous launch window, setting the stage for the expedited propellant loading sequence – a requirement arising from the use of sub-cooled propellants, making the business end of the Falcon 9 countdown all the more eventful. 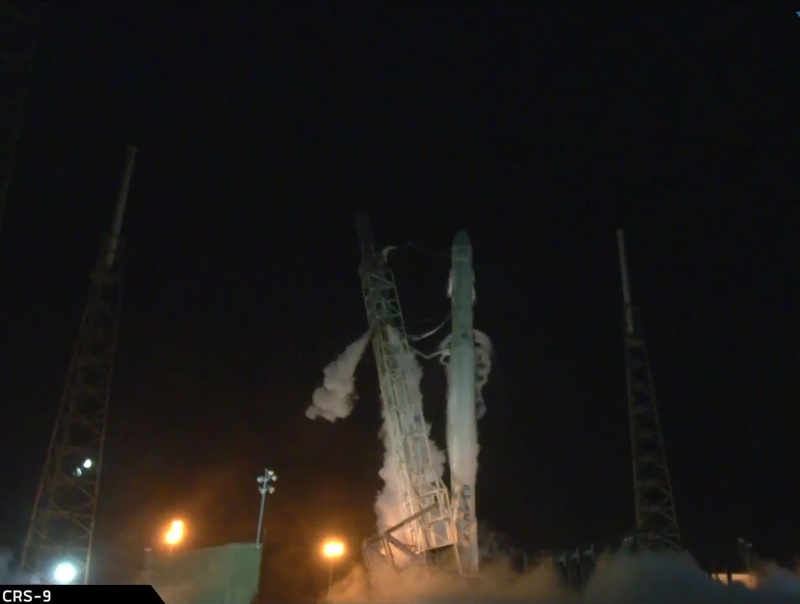 All Stations were polled at T-38 minutes, reporting a unanimous GO to press into the Automated Countdown Sequence picking up at T-35 minutes to load Falcon 9 with propellants. With the Countdown Auto Sequencer in charge, Falcon 9 was filled with over 500 metric tons of Liquid Oxygen, cooled below its boiling point to -207°C, and Rocket Propellant 1, chilled to -7°C, making the liquids more dense to fit a greater mass of prop into the tank volume of the vehicle. Propellant loading went through a carefully throttled sequence as only around one minute of margin was available between the expected end of Oxygen loading and pressurization of tanks for liftoff. While propellants were rapidly flowing into the two-stage rocket, Dragon switched to internal power to be ready for flight, closely monitored by the Flight Control Team in Hawthorne, California. At T-10 minutes, the pace of countdown events accelerated to put Falcon 9 through the final steps, beginning with the chilldown of the nine Merlin 1D engines on the business end of the rocket. 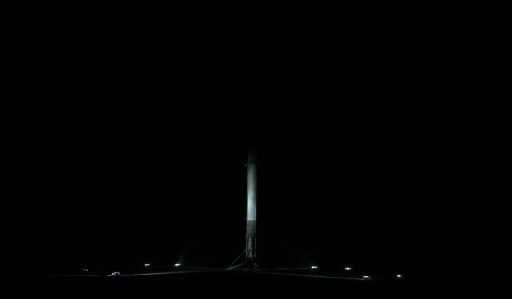 Falcon 9 switched to battery power & armed its Flight Termination System while Liquid Oxygen and Helium tank pressurant were still flowing into the tanks. The countdown showed T-3 and a half minutes when the large Strongback structure was retracted from the rocket followed by the end of LOX loading right on time at the T-2 minute mark. The Eastern Range and Launch Director voiced their final GOs, allowing control to be handed to Falcon’s computers at T-1 minute for final tank pressurization and ignition. Falcon 9 started breathing fire at T-3 seconds when a self-igniting mixture was injected into the nine Merlin 1D engines to initiate the combustion process. Engine start was carefully monitored by computers to ensure all reached operational conditions and a collective liftoff thrust of 694 metric-ton force. 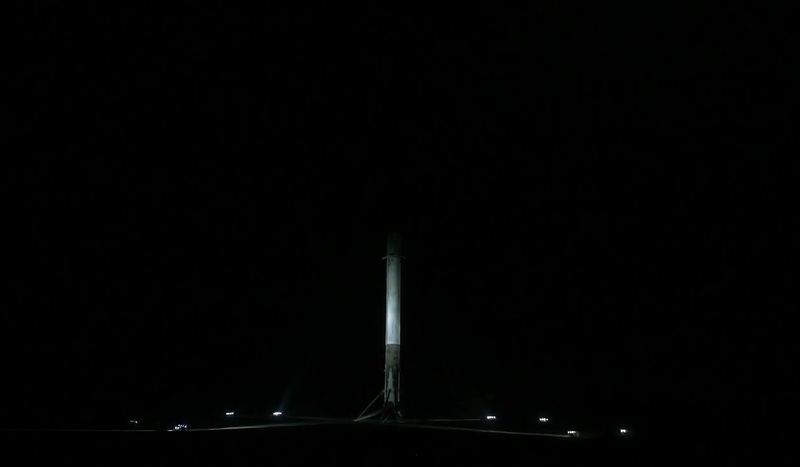 Falcon 9 started rising from its pad at 4:45:29.318 UTC, gimbaling its Merlin engines to climb upright, swiftly clearing the SLC-40 towers. When vertical ascent was complete, the vehicle began its pitch and roll maneuver to turn to the north-east to carry Dragon into the orbital plane of the International Space Station which is already being pursued by the Progress MS-03 cargo craft launched late Saturday and inbound for docking Monday night. Thundering off, Falcon 9 burned through 2,450 Kilograms of propellants per second with all engines at full throttle, accelerating the vehicle beyond the speed of sound just a minute after liftoff. The Merlin engines were throttled back slightly around 68 seconds into the mission when Falcon 9 encountered Maximum Dynamic Pressure. 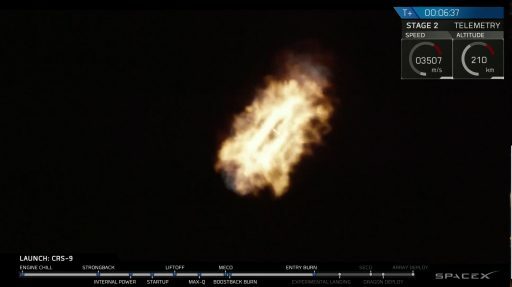 The first stage continued to fire until T+2 minutes and 21 seconds, lifting Falcon 9 to an altitude of 61 Kilometers and a speed of 1.6 Kilometers per second. A lofted trajectory was chosen for this mission to aide the return of the first stage by keeping its horizontal velocity low to minimize the distance to be covered on the flight back to Cape Canaveral. Four pneumatic pushers separated the two stages of Falcon 9 three seconds after MECO with the interstage pulling away from the enlarged MVac engine nozzle to clear the way for second stage ignition eight seconds after staging. The second stage lit up as planned and reached its full thrust of 95,000 Kilogram-force to lift Dragon into orbit by making a 6.5-minute burn. Immediately after staging, the first stage fired up its cold gas thrusters to initiate a very quick re-orientation to face its engines toward the direction of travel for a retrograde boost-back maneuver. 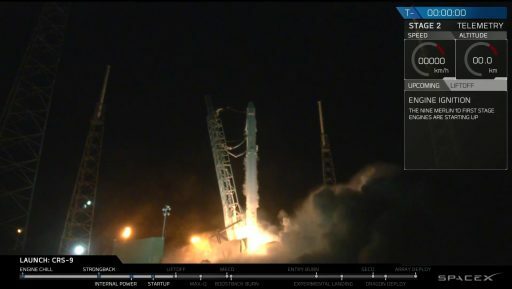 The booster’s full boost back burn utilized three engines for 50 seconds in an out-of-this-world U-turn, successfully reversing its direction and accelerating toward the Space Coast. The four actuated grid fins swung open to be ready to deliver three-axis control once the booster hit the discernible atmosphere, though another maneuver controlled by the cold gas thrusters was next to again face the engines to the appropriate vector for the Entry Burn. 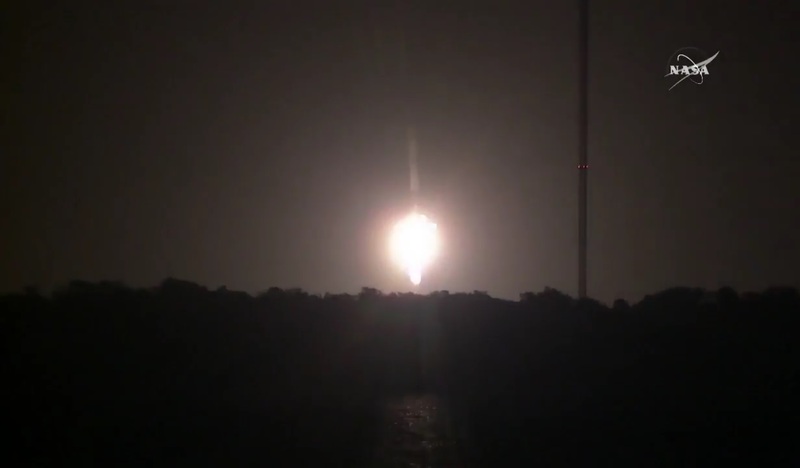 A subset of three Merlin engines lit up again just after passing T+6.5 minutes to slow the booster for re-entry, although heating was not as big a concern on this mission given the lower-energy trajectory after the boost back compared to GTO missions that leave Falcon 9 with no propellant to slow down ahead of entry. Spectators gathered at the Space Coast were scanning the night sky to pin-point the descending Falcon 9 stage, only visible when its engines were running. SpaceX had warned in advance that sonic booms will be heard during the rocket’s inbound leg, going through the transsonic region just before the final landing maneuver. The booster carefully controlled its angle of attack during a 50-second unpowered descent using the grid fins to manage the downrange travel distance, aiming for a point just off the coast where the Landing Burn was programmed to start. Cross-track errors were also flown out during this portion of the descent. 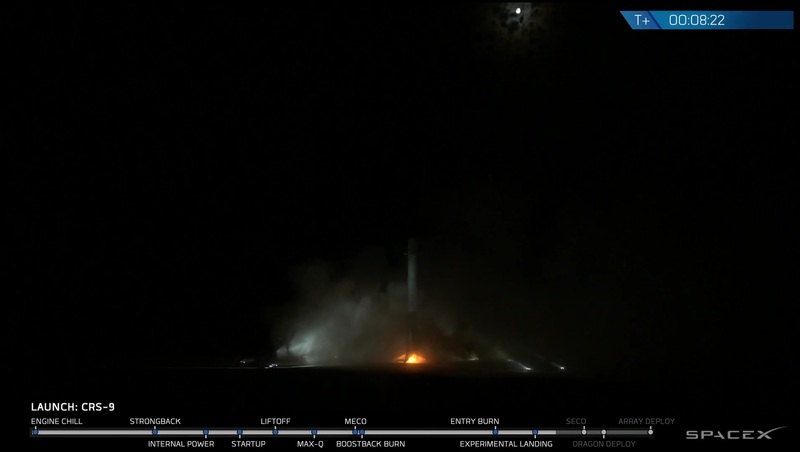 Sonic Booms were heard just before the stage became visible again when igniting its Center Engine seven and a half minutes after launch on the daring landing burn, aiming for the large SpaceX Logo in the center of the flat concrete pad at Landing Zone 1. The four landing legs swung outward while the Center Engine was in for some wild throttle and gimbaling action to slow the booster down for touchdown which appeared to be right on target. Falcon 9 was gently set down on its four legs and the engine shut down to mark SpaceX’s second landing on shore following last December’s LZ-1 landing and three successful Drone Ship landings earlier in the year. Jubilation emerged at SpaceX Headquarters where employees had cheered their first stage on for every step of the way down to its landing pad. A subset of the Cape Launch Controllers were dispatched to a dedicated landing net to remotely safe the landed booster, still a novelty in the spaceflight industry. 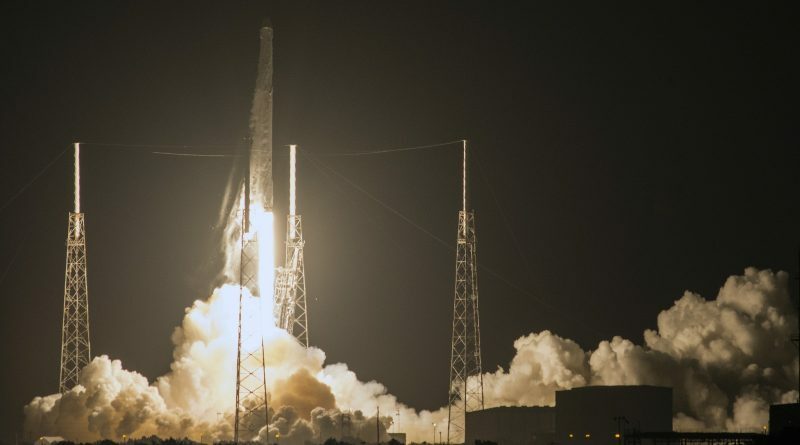 The first stage was already resting back in Florida when Falcon’s second stage shut down its engine 220 Kilometers above the Atlantic Ocean, having achieved a stable orbit for the Dragon spacecraft to embark on its chase of ISS. Shutdown at T+9:02 was followed by the separation of the Dragon half a minute later to mark the completion of Falcon’s primary mission of sending 2,257kg of cargo on the way to the orbiting laboratory. The Dragon started breathing fire shortly after separation, priming its propulsion system and pulsing its thrusters to eliminate body rates for the deployment of the solar arrays. 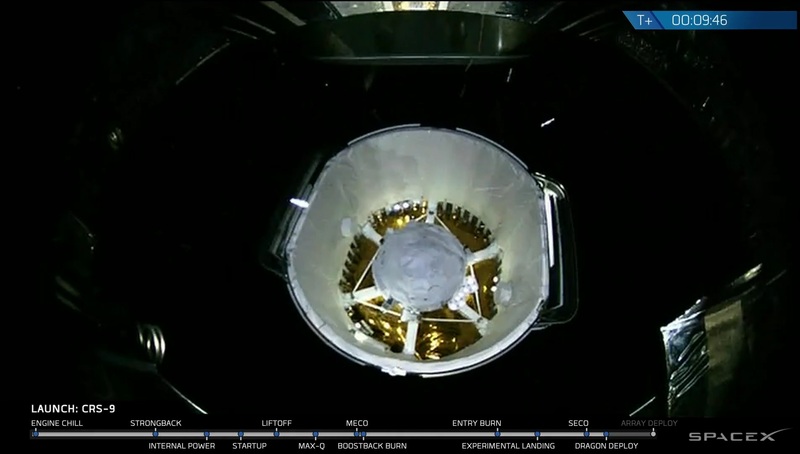 11 minutes after launch, two Solar Array Fairings were jettisoned to mark the beginning of the deployment of the two power-generating solar arrays, a three-minute process that was without issue, marking the successful conclusion of Dragon’s launch. Orbital tracking showed the spacecraft in an orbit of 204 x 355 Kilometers, inclined 51.66° – a very good match with the target of 200 x 360 Kilometers. For Dragon, the rest of the day on Monday will be filled with a series of in-orbit checkouts and reconfigurations for its journey to ISS. 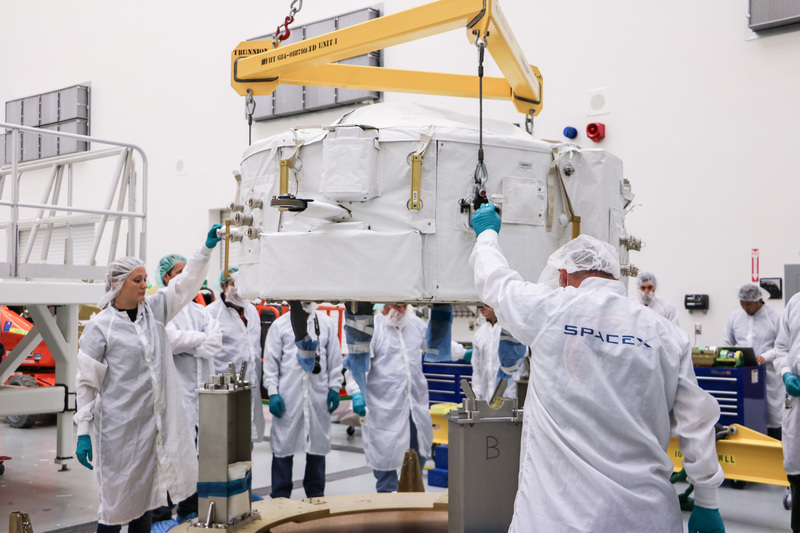 Two hours and 19 minutes after liftoff, Dragon will open its GNC Bay Door – a mission critical event to expose the Star Trackers and rendezvous sensors as well as Dragon’s grapple fixture needed for the robotic capture planned on Wednesday. 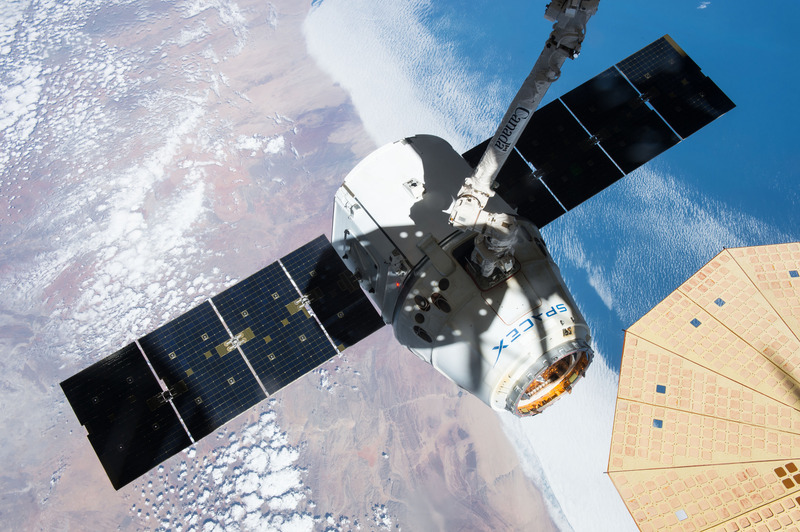 Orbit-raising maneuvers will start later on Monday to set Dragon on a course toward ISS for arrival at 11 UTC on Wednesday when the vehicle will be captured by the Station’s robotic arm flown by Jeff Williams and Kate Rubins. Having mastered another picture-perfect launch and booster landing, SpaceX now has five returned first stages in its inventory – one of which is being set up to go on display in California while another goes through a rigorous testing campaign to clear the way for the re-flight of a used stage later this year – slowly paving the way toward a routine re-use of first stages to be achieved in the coming years. For SpaceX’s future business model, perfecting land-based landings is a criticality as Drone Ship landings will always be associated with some risk of loss of vehicle which has to be factored into launch costs. Falcon Heavy will rely on landing its side boosters on shore to allow for re-use of the majority of the launch vehicle even if the Drone Ship landing of the central core fails on a portion of the vehicle’s high-energy missions. SpaceX said the company was currently in discussion with a potential customer for the first re-flown Falcon 9 booster, aiming for a fall liftoff. Satellite operator SES previously expressed interest in flying a re-used booster and has two satellites up for launch on Falcon 9 later this year, though the customer for the first re-flight has not yet been revealed. 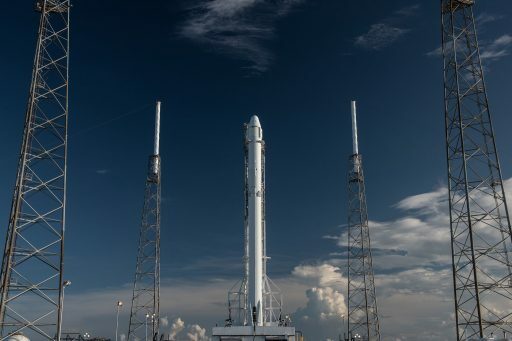 Monday’s launch marked the 27th launch of the Falcon 9 rocket since its 2010 debut, the seventh in the Full Thrust Configuration and the 11th Dragon launch overall. SpaceX’s next Dragon launch is currently planned for November with plenty of commercial missions in between from both of the company’s launch pads on the East and West Coast of the United States.